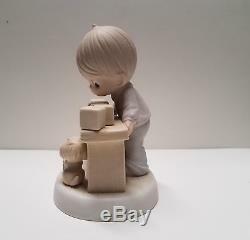 This figurine is a one-of-a-kind, extremely rare Precious Moments piece. 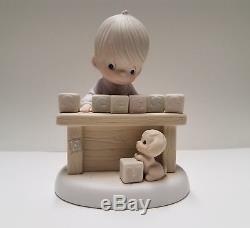 It was the very first sample that was manufactured of this particular figurine and it would later be named, "I Can't Spell Success Without You". It is being offered by Millie Moravec, a dear friend of Sam Butcher and the wife of Sam's beloved high school art teacher Rex Moravec, who was Sam's inspiration for this figurine. While at an early age Sam Butcher had decided he wanted to be an artist, his father opposed the decision. Sam's father and brothers preferred to spend time working on cars and motorcycles, while Sam preferred to spend his time drawing and writing stories. Sam found support elsewhere, though. One of the most influential people in his early life was his high school art teacher, Rex Moravec. According to Sam, He was a talented man who had the unique ability to bring out the best in his students. Rex encouraged Sam to pursue an art career and appropriately, Rex was Sam's inspiration for this figurine. 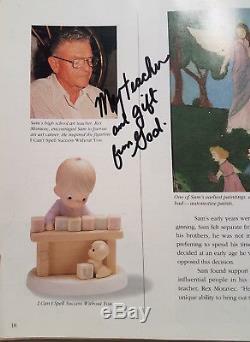 In a 1994 Enesco book that Sam inscribed and gave to Rex titled "Precious Moments Last Forever", Sam wrote on page 18 next to a photo of Rex, "My teacher and gift from God". 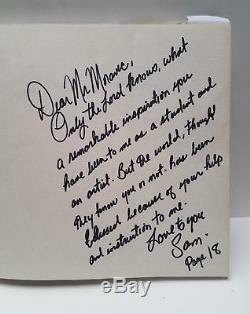 On the very first page of the same book, Sam inscribed, Dear Mr. Moravec, Only the Lord knows what a remarkable inspiration you have been to me as a student and an artist. But the world, though they know you or not, has been blessed because of your help and instruction to me. 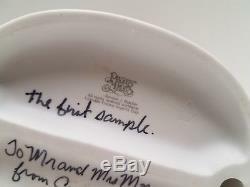 Only this one sample was made initially, as official production could not begin without approval and titling from Sam, which he later provided. It would be titled "I Can't Spell Success Without You" its number would be 523763. Accordingly, this first sample figurine is untitled and unnumbered on the base as neither had been determined at the time it was created. This porcelain figurine does not come with a box for the reasons mentioned above. 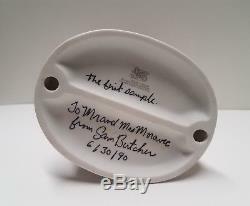 It measures 5.5" tall X 4.25" across X 3.5 and has the flame year of production mark on the base. Sam proudly presented this first sample figurine to Rex Moravec and his wife Millie in the Philippines on June 30, 1990 when they were visiting Sam in his home at Sampguita Gardens. This is an exclusive, rare and very special piece from the Moravec's personal Precious Moments collection and it would make a wonderful addition to yours or a memorable gift for a loved one, as well as an excellent investment. Please note that the scan of the newspaper article about Rex Moravec's retirement from Enterprise High School is shown for reference only and will not be included with the figurine. About the Moravec's collection. 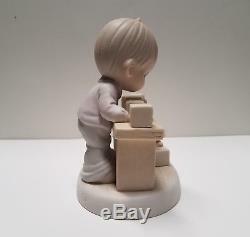 Every item I have listed in this store category, Moravec's Precious Moments, was created by Sam Butcher for his various collections; Jonathan & David, Precious Moments, McCoon County, etc. The items are in excellent, undamaged condition however for the rare occasions where there may be signs of wear on an item, it will be noted in the description and shown in photos. While some of the boxes may show wear, the figurines are all in like new condition. What makes these items really special is that each one of them comes from the personal, private collection of Sam's dear friend, mentor and beloved high school art teacher Mr.
Moravec (Rex) and his amazing wife, Mrs. Moravec (Millie) of Anderson, CA. I have been truly blessed to call the Moravec's and their wonderful family my friends for nearly 20 years, in fact Millie is my best friend in this world. Sadly Rex passed away in 2010, but Millie remains just as active as ever at the young age of 92. Because her new home is much smaller than the one she left, she is no longer able to display her Precious Moments figurines so they have unfortunately remained in storage since her move. Thank you for stopping by and have a blessed day! Please note that the photos below are for reference only and will not be included with the figurine. Sam signing some of the Moravec's figurines in their home during a visit in 1996. The item "RARE Precious Moments I Can't Spell Success 523763 FIRST PRODUCTION SAMPLE" is in sale since Saturday, July 14, 2018. This item is in the category "Collectibles\Decorative Collectibles\Decorative Collectible Brands\Precious Moments\Figurines\Other Precious Moments Figures". The seller is "gidgetpup5" and is located in Weatherford, Texas. This item can be shipped worldwide.